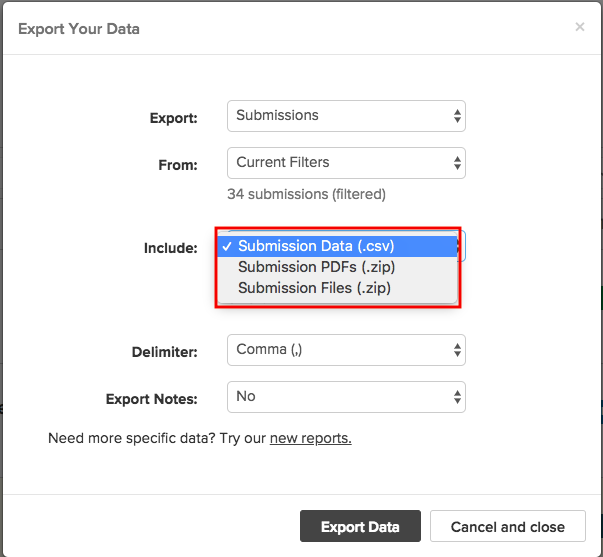 How do I export basic submission form data? Download a variety of submission form data. Submittable lets you export your submission data, or contact information for all of your submitters, to a Comma Separated Values (.csv) file, which is compatible with Microsoft Excel and most spreadsheet and database programs. Additionally, you may download whole submissions in .PDF format for easy viewing of a complete submission. Use the search filters in the Submissions tab to show the submissions containing the data you want to export. Alternatively, you can also check the checkbox next to each specific submission. Once you have the submissions you want to export showing or checked in the submissions list, click the gear icon in the upper right-hand corner of the submission list. 3. Choose Export Data. You will see the following dialog box. 5. Choose From: Current Filters to download a .csv file or PDF files with all submission data associated with each submission in your list OR Choose From: Selected Submissions to download a .csv file or .PDF files with all submission data associated with each submission in your list that you have checked. A .csv file will contain a spreadsheet with submission data condensed into columns and rows for easy analysis. If you select Submission .PDFs you will receive a .zip file containing .PDFs with each complete submission on its own page, in an easily readable format. If you select Submission Files you will receive a .zip file that contains only the attached files associated with each submission, and none of the submission data entered into form fields. Export the entire list of your submitters' basic contact information by clicking the gear icon in the upper right-hand corner of the Submissions list. Choose Export: Submitters to download a .csv spreadsheet with submitters contact information.